There is art that seeks to seduce your sensual aesthetics and there is art that asks to animate your abstraction skills. And, of course there are thousand shades of grey in-between. RAQS Media Collective, though, seem to favour the second path. And if an intellectual approach towards arts is for you, then RAQS might be for you. Guesswork, albeit its title, is a pretty accessible exhibition of four pieces by RAQS Media Collective. After entering the huge, calm, white Frith gallery, you’ll find yourself confronted with ‘Marks’, an installation of flashing red LED lights on a mirror. 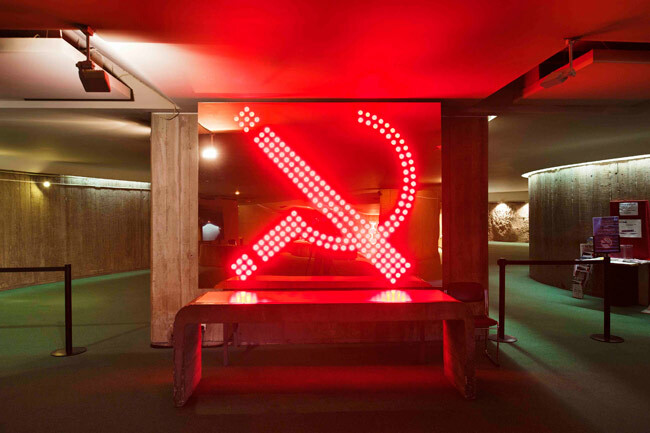 In constant, unhasty turns a question mark, an ampersand and both together crosswise appear and vanish – stylized invocations of the communist symbols of hammer and sickle. Standing in front of the radiant mirror-screen there is a sense of slow immersion, caused by the warmth and the loud regular clicking of the lights switching on and off. This feeling of deceleration and being stuck in a loop will subtly accompany you through the whole show. It proves how valuable a well thought-out background curation is that provides the appropriate atmosphere for the reception of the works. For contemplating needs time and this exhibition is all about you and what you make of the artwork! All four pieces share the pattern of working in cycles, transforming the repetition of static elements into dynamics of conceptual ideas. ‘Untold Intimacy of Digits’ is a video-loop of a digital double-layered handprint. One will remain static and flat, while the other suddenly becomes vital, flexible in 2D and begins counting the phalanx of its fingers. 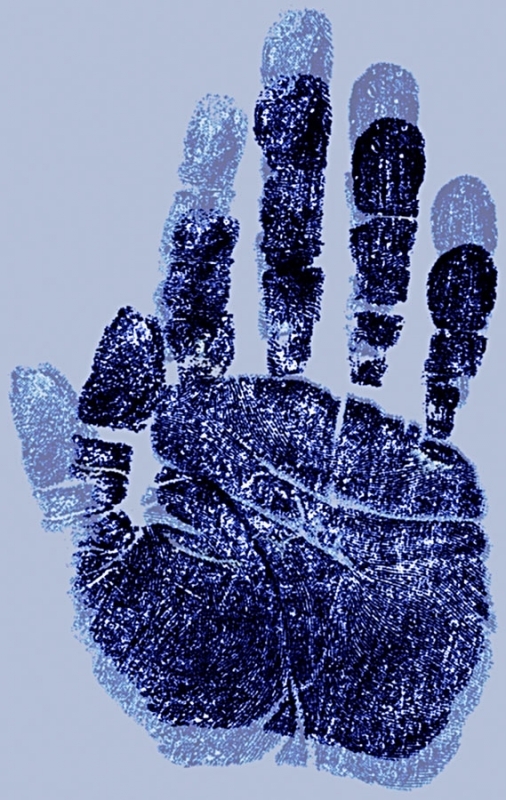 This hybrid enforces an associative conflict between the uniqueness of a human handprint and the indistinguishablity of digital data. ‘Strike’ bears the same logic as ‘Marks’. 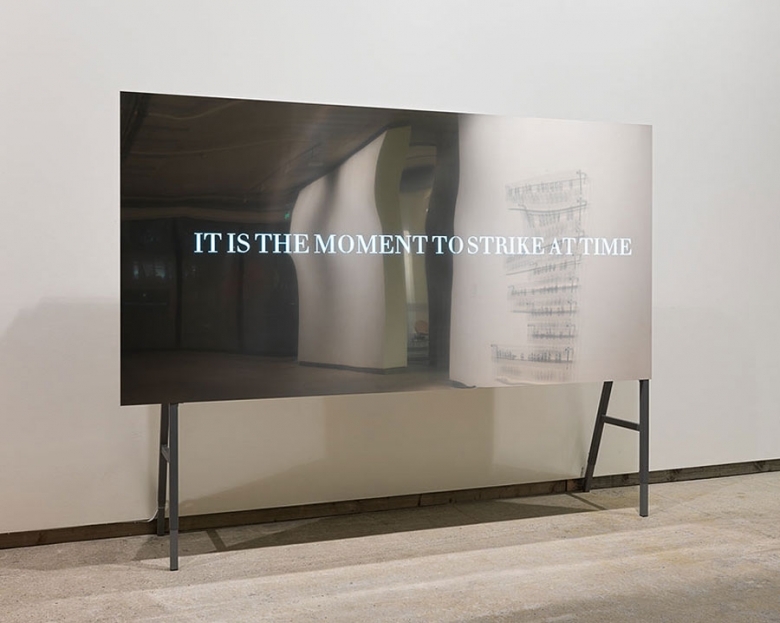 First, single words flash from a mat, reflecting screen in the order of a question: “Is it time to strike at the moment?” Then, they appear simultaneously as the phrase: “It is the moment to strike at time“ – an endless loop of question and answer replaying. And the spectator is left with the decision, how often she wants to rethink the cycles of thought. Each repetition bears the ‘again but singular’, just as we rack our brains about the same issues all life long. Answers only come with every new input or interpretation we admit in each round. ‘Re-writing on the wall’ is a visual poem in Sign Language. The very handprint from the video-loop opposite is now used to form single printed letters, spelling words in short phrases and the lines arranged one upon the other on the wall. Even if illiterate in Sign Language one can see that there are patterns, repetitions of letter combinations, and their formation resembles verses. The translation reveals the to and fro dynamics of this last work in the room: ‘I’ and ‘We’ are the repeatedly alternating words one can decipher. And it makes sense to now rethink the whole sequence of impressions and ideas one had in the room – Guesswork becomes a challenge and stimulation at the same time. This exhibition will give you as much inspiration, as you are willing to invest time and thinking. RAQS work somewhere between a mirror and a facsimile – reflecting and showing only inasmuch as communication is an act of engagement and interpretation. In the end, upon returning to the first piece, I finally understand more of the idea: the succession of question mark, ampersand and both together against the background of communism and my presence in a reflection is referring to the idea of history’s development in great cycles of dialectics – after all ‘Marks’, the title, rhymes with ‘Marx’. Thesis, anti-thesis, synthesis. And off I start to discover the exhibition in another round, and another, and another … realizing, it’s easy to mistake a spiral for a loop!